SUMMARY: For the second day in a row, the most significant story for us — away from the inspection of the regime’s chemical weapons stocks and another UN call for access to deliver aid across Syria — is the fighting in Daraa Province in the south of the country. On Wednesday, battles and airstrikes flared throughout the area, notably in Tafas, north of Daraa city. Insurgents have already seized an important crossing on the Jordanian border south of Daraa, and they are laying siege to Tafas — which is the main highway to the north of Daraa — to try and cut the off the city, where the Syrian uprising began in March 2011. Footage on Wednesday showed firing, including with anti-tank weapons, on a barracks in Tafas. The regime responded with attacks that, according to graphic video, maimed and killed a number of the insurgents. Two media activists, including the prominent Abo Gamal, were also killed. 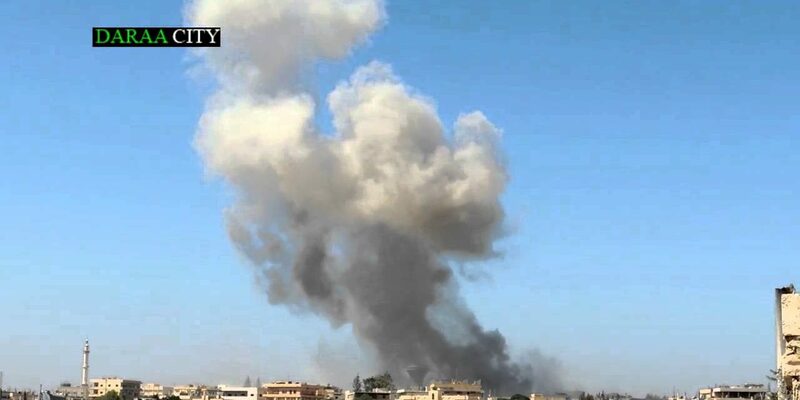 Fighting and airstrikes were also reported in Inkhil, to the north of Daraa, and in the city itself. The insurgents have already won a notable victory with the capture of the border post, allowing more arms and supplies to be run to the opposition. The claiming of Daraa would give the opposition an area from which they could move further toward the south, seeking to approach Damascus. Video showing the official announcement of a new faction, the Jaish Ahl As Sunnah wal Jamaa, in Deir Ezzor. The new group consists of the following brigades, according to its Facebook page: Liwa Ahl Al Athar, Liwa Aswad Assunah, Liwa Al Fatah, and Liwa Ahl Al Raya. The group said that the new brigade will be the “nucleus of the Muslim Army in the Eastern region” and invited others to join its ranks. A short but powerful video report by Shaam News Network from September 29 shows the immediate aftermath of a regime rocket attack on a residential neighborhood in Deir Ezzor. A home is destroyed and its residents — a man and a woman — are trying to clean up, a futile effort as the side of their apartment block is completely blown away. Hopes had been high last week that a United Nations convoy would reach the embattled rebel-held suburb of Moadhamiya for the first time in months, after an initial green light from some government agencies. But the trip did not materialize, United Nations officials said, after the government said military operations were continuing in the area. The United Nations has also struggled to reach government-held parts of Aleppo, because the route from Damascus passes through areas controlled by myriad rebel groups. Many times, officials say, the convoys have been allowed through by a series of rebel factions, only to be stopped or looted by one farther along the road. A pro-government Syrian journalist said he was shocked to learn that a number of chemical weapons facilities were in rebel-held areas. That, he said, may well mean that the dismantling process could easily take well over the yearlong timetable that has been proposed, and could require international forces to guard the inspectors and any weapons or materials that have to be moved. Footage posted on Wednesday of a German Salafist, Abu Adam, in Syria. Abu Adam, born Sven Lau in Monchengladbach, mid-West Germany in 1986, converted to Islam from Catholicism in 2005. He is the former head of the Sunni mosque in his hometown. In the video, he asks for donations, not jihad. He emphasizes oppression and the humanitarian disaster in the country. Der Spiegel interviewed Abu Adam in March, when its reporter ate a California Turkey Club Toasted Sandwich at Chili’s in Alexandria, Egypt. His name is Sven Lau, but he calls himself Abu Adam. He is 32, was born in the western German city of Mönchengladbach, served in the German military and trained to be a professional fire chief. He converted to Islam 14 years ago, and Germany’s BfV has had him under observation for an unspecified period of time. He is allowing Rathkamp [another German Muslim convert] and me to sleep in the room normally occupied by his three children until Rathkamp can find his own apartment. Lau, considered to be one of the leaders of German Salafists, ran a mosque in Mönchengladbach and was chairman of a fundamentalist group called “Invitation to Paradise.” He was once charged with setting his own mosque on fire to simulate arson, but was later acquitted. Civil rights advocates oppose him because they believe he would introduce Sharia in Germany. The BfV is watching him because it believes that Lau wants to abolish the democratic constitutional state and establish a theocracy. German prosecutors are also looking into accusations of aggravated battery against Lau, who allegedly beat a reveler during Germany’s Karneval festivities. The insurgents of Tahrir al-Sham claim they have captured a large number of tanks at a regime base north of Damascus. It is unclear whether the tanks are operational. A new video from the Islamic State of Iraq and Ash Sham shows the Islamist faction traveling around Raqqa in a van, in order to preach to various groups of civilians on the city streets. Over the last 10 days, we have been reporting on the humanitarian crisis in Moaddamiyat Ash Sham — one of the Damascus suburbs attacked by chemical weapons on August 21 — with malnourished children and people at risk of starvation amid regular regime airstrikes. The town has been under siege by government forces since April…. The paramilitary fighter, speaking on condition of anonymity, said he is a law student who joined the local branch of the pro-regime group known as the National Defense Force almost one year ago in order to defend his neighborhood. Like almost everyone in his section of town, he belongs to the Shiite-linked Alawite minority dominating the regime. He said he and other fighters like him have been tasked by the army unit stationed in the area to make sure nobody leaves or enters the rebel-held side of town. Dressed in military fatigues and clutching an AK-47, he raced up during an interview on Monday to a rooftop sniper’s nest that was fortified with construction blocks and sandbags. Empty bullet casings littered the ground. He said he only shoots fighting-age men he spots on the enemy side, but not women and children. All roads and alleyways connecting the two sections of town are now blocked with earthen berms and stacks of barrels, along with broken refrigerators converted into makeshift shields from sniper fire from the rebel side, according to residents. There has been a recurring pattern since June, when the Obama Administration announced it would publicly deliver arms to insurgents but never followed through. Each time that the Administration steps back from intervention, some of its officials — because they dissent or because they want to put out a token reassurance — leak to the media that, covertly, the US is providing assistance to the opposition. The officials…said the agency has sent additional paramilitary teams to secret bases in Jordan in recent weeks in a push to double the number of rebel fighters getting CIA instruction and weapons before being sent back to Syria. We are seeing an increasing amount of weapons like these machine guns and also Croatian-made anti-tank weapons in the hands of Free Syrian Army fighters in Tafas. It is unknown whether the weapons are taken from regime supplies captured by insurgents, whether they are weapons supplied earlier in the conflict or whether they are new supplies being brought across the nearby border with Jordan. The Local Coordination Committees claim 62 people were killed on Thursday, including 15 in Damascus and its suburbs, 14 in Idlib Province, 14 in Aleppo Province, and 13 in Daraa Province. The Violations Documentation Center puts the number of dead at 74,675 since the conflict began in March 2011, an increase of 121 from Wednesday. Of the dead, 55,786 are civilians, a rise of 55 from yesterday. PreviousIraq Spotlight: Islamic State Of Iraq Responsible For Mosul Pipeline Blast?